Yung Bans has been rumored to be the latest signing under Future's label for quite some time. It was reported that Bans had signed to FBG early this year but the rumors were shut down by Yung Bans himself, saying he was still an independent artist. While he may not have officially signed to Future, Hendrix seems to know a lot about the young rapper's career trajectory, tweeting recently that Bans is making upwards of $30K per show. The two are continuing to incite talks of a potential signing to FBG, or at least a future collaboration by posting a photo of the two together on social media. Although the 18-year-old ATL rapper could have just been chopping it up with another Georgia native, it's likely that there was some business talk involved. Future appears to have been overseeing or at least playing a part in the development of Yung Bans' career and while a signing may not have been confirmed, the photo sparks further rumors that it could be imminent. 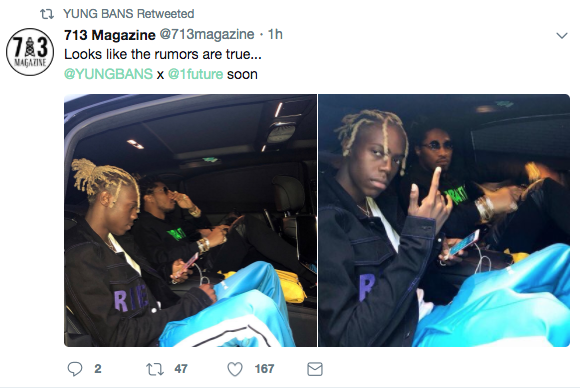 Lending support to claims that a deal has been struck between the two, Bans retweeted a Twitter user who posted the image and wrote, "Looks like the rumors are true... @YUNGBANS x @1future soon." Whether or not Yung Bans has signed to Future's label, the young upstart has a big year planned as he prepares for the fourth edition of his self-titled mixtape series. Check out the photo below and let us know where you think Bans should sign?